There were only two nailed on sprint finishes in this race and today is one of them. This hasn’t stopped Giant-Shimano’s Luka Mezgec winning three stages so far and the route today is ideal for him. But there’s an uninvited guest today: the wind. With Flanders enjoying balmy spring conditions, Catalonia is colder and windier and today’s stage could see crosswinds do some damage. Stage 5 Wrap: a busy of breakaways but all their efforts came to nothing with a bunch sprint. The first hour was wild and later in the race Alberto Contador tried a move but was chased down by raced Joaquim Rodriguez. It was another win for Mezgec, he’s making it look easy. Interestingly Contador was sixth, he’s hunting for time bonuses. The Scenario: a good chance of a breakaway again because teams are scrambling for a stage win and faced with Luka Mezgec they have to send riders up the road. Mezgec is still the default pick for the stage but even if he’s been winning so far, maybe three is enough? 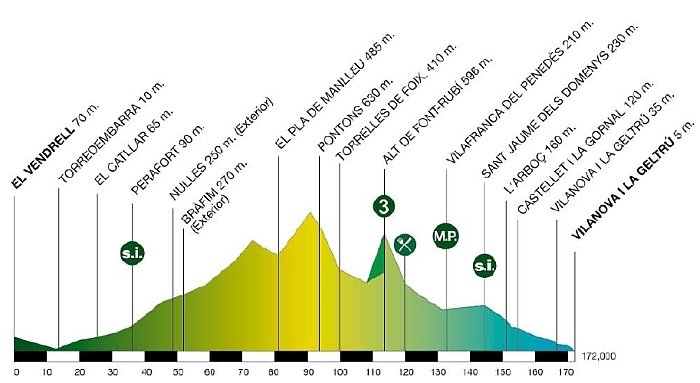 It’s an outside chance but what if OPQS did what they do best and split the bunch with Julian Alaphillipe getting his first win? Weather: it’s warmer in Wevelgem right now. The stage will see cloudy skies, a top temperature of 17ºC and crucially a 45km/h wind from the west. TV: 90 minutes starting from 3.30pm to 5.00pm Euro time. It’s on TV in Spain and Eurosport around the world but if you can’t find it on TV cyclingfans.com and steephill.tv are the go-to sites for TV schedules and feeds. Daily Diaz on Catalan society: 16 % of Spanish population lives inside Catalonia. Most Catalans have been born outside Catalonia or to foreign parents (hundreds of thousands of Catalans have Andalusian origines, for example). This immigration can be explained by the economic development of Barcelona and its metropolitan area. Of course there is a rural Catalonia which can’t be forgotten, but nearly half the population lives in Greater Barcelona. The roads seem not so wide today. Perhaps it’s a good omen. That video has me laughing & crying ! The real climbing deal, today, is not registered, neither can it be easily seen in the profile. It’s between La Joncosa and Aiguaviva: they’re not marked on the map but I think they’re 65-70kms from the start. It’s a Flanders-style 700m-13% wall that reaches even 17-20%, with an ill-surfaced concrete pavement (at least, last time I went around there). A pity it’s so far from any time-bonus that attacking here may prove risky while totally useless, especially because you don’t have so much terrain before to reduce the number of surviving “gregari”. Anyway, it should be considered that what follows isn’t the easiest route to reel the fugitives back in, at least not before intermediate sprint. During what would be the worst part for the fugitives (flatland between S. Jaume and Vilafranca), there will be a strong favourable wind. From the I.S. to the end, instead, they’ll get front or side winds without much cover, hard times for the “fuga”, but possible crosswinds, yes. 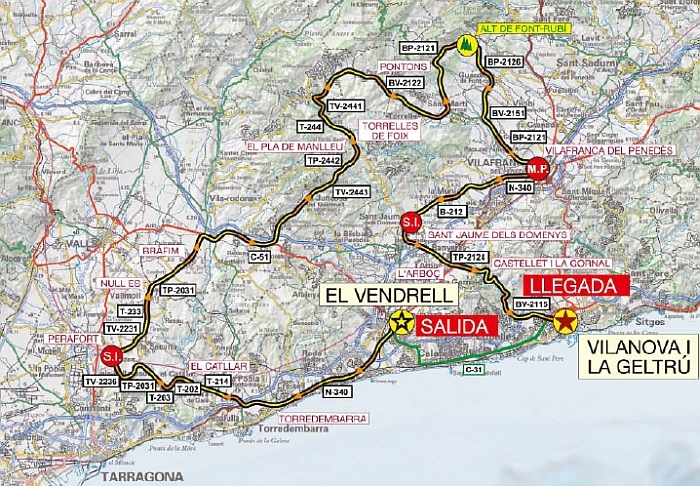 My personal “road to ride” near today’s stage is TV-2443 (maybe starting with TV-2444) from Vila-Rodona or Rodonyà to Aiguaviva. Diminute 15-20kms road in the Montmell natural park, you’ll climb from rural sceneries to an uninhabited woods/mountains landscape. Not much climbing, just a few easy final kms, zero traffic, beautiful surroundings. You can even climb from La Juncosa (with the above-mentioned “wall”) and descend here, depending on your attitude, touristic or sporty.